View More In Ball Joint & Tie Rod Tools. Try our brand new Ball Joint Service Tool and Master Adapter Set, which includes all the receiver tubes and removing/installing adapters needed to work on press-fit upper and lower ball joints on most GM, Ford, and Dodge 2 and 4 wheel drive pickups, vans and sport utility vehicles. Comes with blow molded carrying case, making it easier to keep the tools organized and easy to transport. Package Dimensions: 24.0" x 19.69" x 4.72"
 ESSENTIAL TOOL FOR BALL JOINT SERVICE ---- Use the ORION MOTOR TECH 22PCS Ball Joint Press Set Ball Joint Tool / Bushing Removal Tool with multi-size adapter to effortlessly remove press fit parts including ball joints, U-joints, brake anchor pins, and more on most 2-wheel drive (2WD) and 4-wheel drive (4WD) vehicles without removing the control arm from the vehicle.  PROFESSIONAL GRADE QUALITY AND DURABILITY ---- Off road weekend warriors, novices, and professional mechanics trust the ORION kit because ORION MOTOR TECH sources the highest quality components from around the world. Constructed from heavy-duty forged solid carbon steel with anti-rust black-oxide finish on adapters for maximum strength and longevity that resists rust and corrosion. 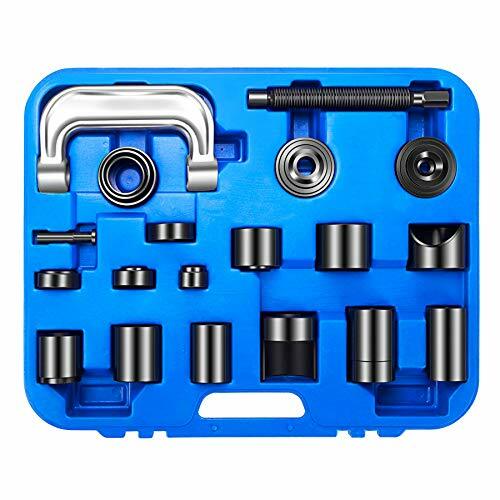  CONVENIENTLY ORGANIZED IN CUSTOM MOLDED CASE ---- Ball joint press / bushing/ removal tool kit is enclosed inside a heavy-duty ABS plastic blow-molded carrying case with handle for easy storage, safe storage, and quick organization. Package include: 9x Adapters, 1x Center Rod, 1x C-Frame, 1x Install Adapter, 1x Install Cup, 1x Install Cup Adapter, 1x Receiving Cup, 3x Receiving Tube, 1x Removal Adapter, 1x Screw, 1x Sleeve.  BACKED BY LIFETIME WARRANTY ---- All ORION MOTOR TECH automotive tool kits are heavy duty, professional grade, so it's easy to stand behind everything we sell. ORION's customer service is second to none. Buy confidently knowing that your 4x4, car, or truck is in good hands.